My good friend, Tom Handley, has worked in fashion for decades and, as a professor of marketing and public relations at Parsons School of Design in New York, and ISEM Business Fashion School in Madrid, an educator in the esteemed Fashion Communication and Promotion program that is part of the Dual City curriculum with Central Saint Martins, and a guest professor at Polimoda in Florence, he has mentored and helped launch the careers of hundreds of industry professionals all over the world. So, when Tom moved to Denver last year and gave me the heads up that the Denver Art Museum (DAM) would be hosting Dior: From Paris to the World, the first-ever U.S. Dior retrospective, I knew he’d be the exact right person to fill me in on everything that the fashion flock must do when they descend upon the Mile High City to take in the show. Some of Denver’s chicest hotels are in LoDo and fit this description to a T. The Crawford, in Denver Union Station, boasts panoramic views of the Denver skyline and the Rocky Mountains, features its own collection of Colorado artists and has consistently ranked on best hotel lists since it opened in 2014 as part of a $500 million, five-year Union Station redevelopment project. A few blocks away, in what’s known as the Dairy Block micro-district, Maven Hotel is The Crawford’s craft-cocktail-slinging little sis (they’re both owned by Sage Hospitality Group). It also features Colorado artists — in fact, more than 700 paintings, sculptures, photographs, etc. — totally curated to slay on the ‘gram. Known for its quirks, Maven’s loft-like rooms tend to average a (semi) starving-artist-friendly per-night rate of $189. The Semple Brown-designed Kimpton Hotel Born was described by the New York Times as having a wild West-meets-modern aesthetic, and as being a truly dog-friendly hotel (an amenity which might appeal to Dior’s second creative director, Yves Saint Laurent, who owned a succession of French bulldogs, all named Moujik). Guests pay penny admission to the Museum of Contemporary Art Denver (just a block away), and can drift away on Frette sheets, greet the dawn with sun salutations on their in-room yoga mat, and take the house Tesla to the elite Colorado Athletic Club, which is open to them for the duration of their stay. Closer to the exhibition, The Art, A Hotel feels like a museum in itself. And, in fact the hotel’s curator, Dianne Vanderlip, is a former curator at DAM. The first luxury hotel in Denver’s Golden Triangle, The Art wows from the start with a spectacular light installation by Leo Villareal, and keeps visitors agog with works by Kiki Smith, Sam Francis, Sol Lewit — really, it’s a who’s who. By the time you get to your room (with its own art! ), you feel 35 percent cooler, sexier and more cultured. And maybe a little ravenous. Tom, who was always partial to neighborhood Asian bistros in New York, recommends dining at ChoLon at the nearby 16th Street Mall (which is also great for people-watching). Chef Lon Symensma is an alum of the Jean-Georges empire and has racked up his own impressive list of awards and rankings (including a James Beard finalist nod for Best New Restaurant when ChoLon opened in 2011). He’s also building an empire of his own. This year, he’s opened BorraCho Tacos, (street food with global flavors) in the Avanti Food and Beverage hall in LoHi (the trendy Lower Highland District), Cho77 (more street food) and LeRoux (modern takes on classic French and European cooking) which is slated to open during the holiday season next to ChoLon. Another recent French entry into the Denver dining scene (it’s Dior, after all) is Morin, owned by chefs Max MacKissock and Blake Edmunds. The artfully designed restaurant is Denver’s riff on what Parisians call bistronomy — crave-able, of-the-moment dishes made with local ingredients, but prepared according to classic French gastronome techniques. The vibe is very Rive Gauche en hiver— seductive and cool, yet also warm and homey. Dior: From Paris to the World, which runs at DAM through 3.March.2019, covers 70 years of the fashion house — from its founding by Christian Dior in 1947, through each of its subsequent creative directors, Yves Saint Laurent (1958—’60), Marc Bohan (1961-’89); Gianfranco Ferré (1989-’96); John Galliano (1997-2011); Raf Simons (2012-’15); and Maria Grazia Chiuri (2016 to present). 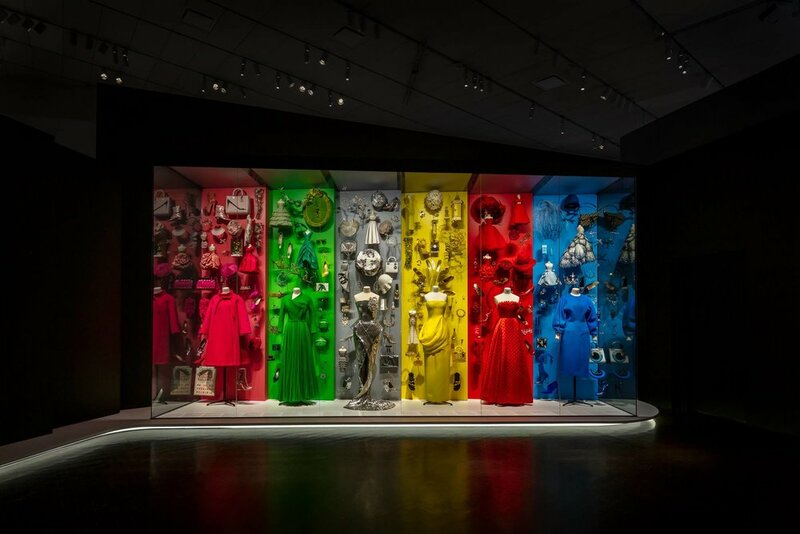 It showcases more than 200 couture dresses, as well as accessories, costume jewelry, sketches, photographs, videos and other archival materials that tell the story of the legendary house — and its world-changing impact on fashion in its first seven decades. After the show closes in Denver, it will move on to the Dallas Museum of Art (19.May-1.Sept.2019).